I spent some time along the north shore of Lake Superior this past weekend with my family. The flies were terrible along the lake shore; they chased us away from Gooseberry Falls State Park. Park Rangers we talked to said they were the worst they had ever seen this year. The next stop was Split Rock State Park. When we arrived it was rainy and there was a strong breeze which kept the flies down to tolerable levels along Pebble Beach at the park. 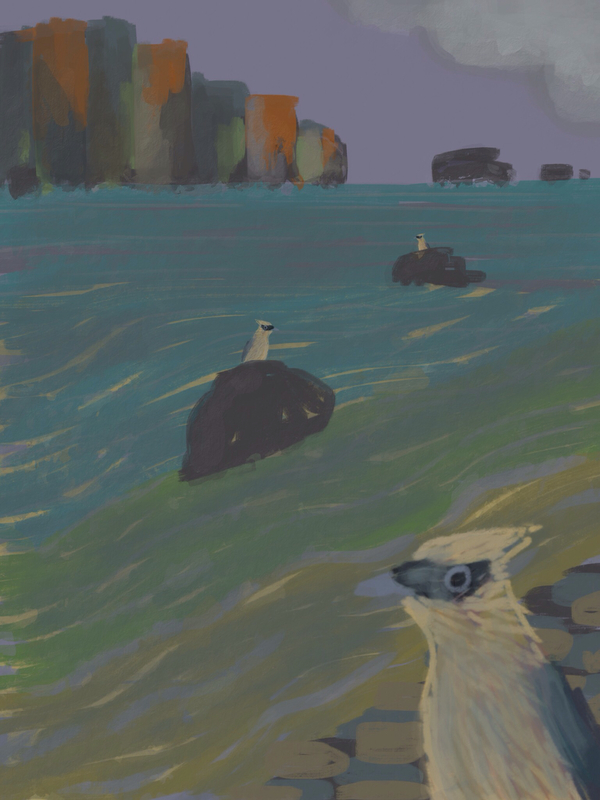 I noticed quite a few birds sallying forth from the shore and from the rocks emerging from water. They were appeared to be catching insects in the air. The light was poor and I had to get closer before I could determine what they were. Before the breeze died down and the flies returned I got some good looks and was surprised to see that the birds were Cedar Waxwings, acting as if they were some cross between a flycatcher and a swallow. I suppose I shouldn't have been surprised, I've seen enough other birds behave in surprising ways (a flock of minnow ice-fishing American Robins comes to mind). At Cornell's All About Birds entry for Cedar Waxing it mentions that "They also course over water for insects, flying like tubby, slightly clumsy swallows." and "In summer you're as likely to find them flitting about over rivers in pursuit of flying insects, where they show off dazzling aeronautics for a forest bird." Neither of these two descriptions quite fit my image of Cedar Waxwings; I might describe them as birds with a unique and sleek plumage that gather together in moderately busy and chatty flocks in the winter to feed on berries. And it wasn't just the flycatching behavior that surprised me. I was also surprised to see so many of them perched rocks out in the water. So un-Cedar Waxwing like in my mind. . . But really the behavior wasn't odd at all, just an example of an animal taking advantage of an abundantly available food source.